Talks between Russian President Vladimir Putin and his Ukrainian counterpart Petro Poroshenko at the Customs Union summit in Minsk on August 26 appear to have yielded little, with neither party able to make any progress in resolving Ukraine’s internal conflict beyond establishing steps for increased border cooperation. RBTH asked several Russian commentators for their view on the negotiations. 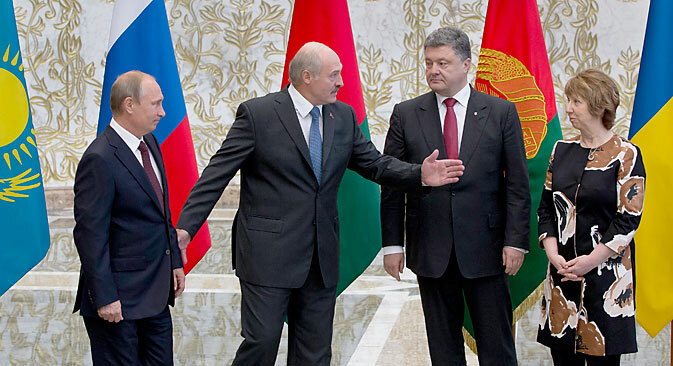 On August 26, Russian President Vladimir Putin held bilateral talks with his Ukrainian counterpart Petro Poroshenko at the Customs Union summit in Minsk, Belarus. However, it appears that the meeting did little to bring the sides together on the issue of the conflict in eastern Ukraine. According to Russian commentators, while the results of the negotiations fell short of expectations, the question of future economic cooperation between the Customs Union (of Russia, Belarus and Kazakhstan), Ukraine and the European Union remains open. In spite of the limited results of the talks, however, Moscow and Kiev did make some progress regarding interaction between the two nations’ border authorities, which will help reduce bilateral tensions. It seems all of the expectations leading up to the meeting between Putin and Poroshenko have vanished into thin air. It has become clear that there are to be no serious shifts in bilateral ties, as the meeting yielded no serious results. The only nuance that emerged is the fact that Russia’s position and views on Ukraine’s accession to the European Union from a purely economic point of view have been made apparent. Nor did we see any progress in settling the political crisis inside Ukraine. Putin and Poroshenko talked about creating a contact group for the Russian and Ukrainian border authorities. This, of course, is an attempt to find common ground, but it is no reason for the hostilities to end. Usually, the purpose of negotiations is to get a grip on major disagreements and issues on which compromise can be reached; however, I don’t see that at all in this situation. This primarily has to do with exchanging prisoners, and we already know that there is a scenario of exchanging all for all. That is a possible option. During their negotiations in Minsk, Russia and Ukraine agreed to hold consultations between their border authorities and general staffs in the context of resolving the situation in Ukraine’s eastern regions. However, so far it is rather difficult to predict the outcome of that. Ukraine continues to unilaterally make allegations that Moscow is delivering military hardware to the separatists in the southeast, without providing direct evidence of Russian interference. There is a presumption that Russia is a party to the conflict. This is generally accepted in the West, and several of our own experts believe the same. However, as Vladimir Vladimirovich [Putin] said at the meeting in Minsk and has stressed repeatedly to journalists, Moscow is not supplying weapons to the separatist forces. Russia is not in conflict with Ukraine. The Russian president said directly that we cannot set the terms of reference for conducting peace negotiations; that is the business of Kiev and the authorities of the breakaway people’s republics. We can merely provide assistance in initiating the peace process. Another result of the negotiations was an agreement to hold consultations on energy issues and to have expert-level meetings on the economic consequences of creating a free trade zone between Ukraine and the EU. A meeting between the Customs Union [of Russia, Belarus and Kazakhstan] and Ukraine has long been brewing after the signing of the latest EU association agreement. All of the parties involved understand that an agreement will have to be reached sooner or later. We are, after all, neighbors with historical and economic ties. Ukraine will still be a transit country for us, and we will have to seek the necessary mechanisms to adhere to our mutual economic interests. Yes, there is a risk that goods will flood into Russia from Europe, but let’s be objective – countries have learned to overcome that risk. For example, after signing a free trade zone agreement with China in July 2013, how is Switzerland protecting itself from floods of duty-free goods from the ASEAN, Chile, Peru, etc., with which China has similar agreements, through China? The answer is simple. Only goods that are 100 percent obtained or produced in the country or that have undergone a “substantial transformation” are subject to the free trade agreement. In addition, the agreement explains in detail what is meant by “wholly obtained or produced” and “substantial transformation” – all possible cases. A similar agreement could be signed between the Customs Union, Ukraine, and the EU.